The SCDOT Commission assigns funding levels to those program categories using the practice of performance management, which ties investment levels to desired targets. 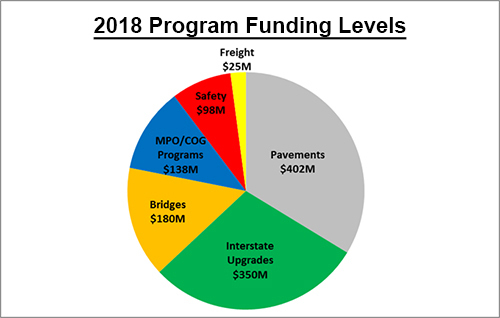 The Ten Year Program Funding chart will show the next 10 years of planned funding levels for the programs and show how SCDOT plans to grow these programs over time to match the increased gas tax collections in the state. Next, potential projects are scored within each category based on the applicable criteria. The top candidates in the pool are further evaluated in the field and a final ranking score is determined using input from local engineers familiar with the current needs of the area. Projects are then selected from the candidate pool and developed in priority order based on the planned program funding. Most resurfacing projects are prioritized on a county level, with only interstate and routes on the National Highway System (NHS) being prioritized on a state level. Interstate widenings, bridge replacements, safety and freight programs are ranked on a statewide basis. MPO/COG programs are ranked within the respective geographic region. The prioritized lists of projects for the programs are submitted to the SCDOT Commission for approval. Following Commission approval, the ranked lists are placed on a 21-day period to allow the public to comment on the proposed projects. At the end of the 21-day public comment period the projects are placed in the comprehensive State Transportation Improvement Program (STIP), developed, and then advanced to construction. All raw data used for project prioritization is kept on file as required by SCDOT Departmental Directive 51 and SCDOT’s record retention schedules.